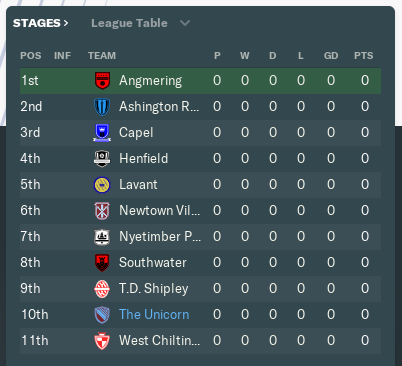 I picked the Unicorn also because their first league only has 11 teams meaning 20 fixtures, this means I’ll speed through this first season in comparison and don’t have to spend too much on bring in players for match congestion. We are predicted to finish 2nd so I’m hoping we can finish at least top 2. After finding any player with over 10 pace, I decided to just play around a star attacking player; Jack Shaw, whilst you probably think he looks awful, the 19 Natural Fitness will carry me through this season and a 195cm, 2 heading will scores loads from corners! Not sure he’ll be here for the long term but he’ll definitely help us out of the pit! I’ve also brought in Carl Milton, a rock at the back of a shoddy defense, who will hopefully stop too many goals going in, although a strong 6 heading at 194cm will make me a real threat from corners. As you can see, this is slightly different to the Deli Alli/ John Stones combination I have to work with in my England set-up, but the similarity is slightly exaggerated. Also the other issue is that’ll as we don’t have an international break, I’ll be jetting off between fixtures to attend to my other team. Flying to Spain on Thursday, flying back to Brighton for Saturday to fly out to Boznia for Tuesday. Bit of a hectic week! So how’s it going so far? Well my club team actually lost to our U23’s, the first time I’ve ever lost to my reserves in a Football Manager game (I’ve been playing for nearly 8 years now). However we picked up two wins out of two in the league, both 3-1 victories against Southwater and Newtown Villa. I’m a little concerned as I picked up a total of 11 yellow cards across the two games, I’m not sure if that’s just how non-league works (I know that’s what Sunday League is like though) But It’s something I’ll need to manage carefully. Jack Shaw played a blinder! So the clubs off to a good start but what about country? Well my first game is against Spain in the Nations League, and obviously that wasn’t the easiest of matches however I managed to scrape a draw… after two red cards. I’m starting to think I’m just encouraging a very aggressive style of play and I need to tone that down a tad. Two Spurs players sent off, am I even surprised? So the next article will consist of an update up until Christmas, a look at my stars for both club and country and how my ties with the FA are helping surge my club growth!